Gorilla Max is the most advanced K9 Muscle Building Supplement in the world. 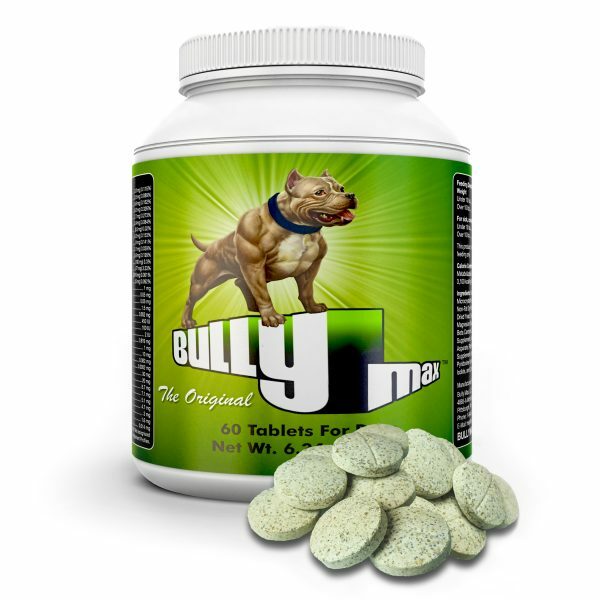 Bully Max released a revolutionary dog protein supplement, “Gorilla Max”. 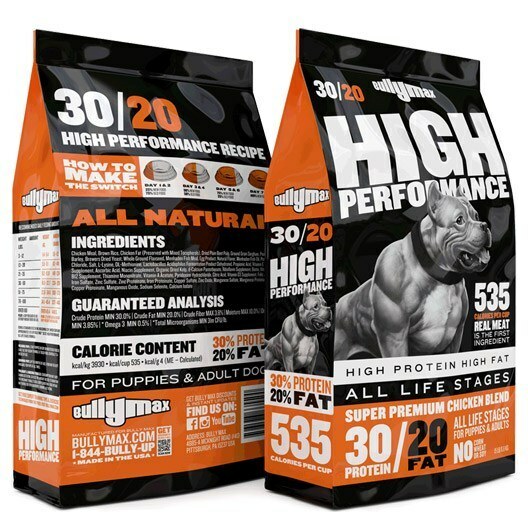 With 20 grams of quality protein per scoop and all of the muscle building ingredients your dog needs. Gorilla Max is veterinarian designed to achieve maximum growth, build lean muscle mass, and achieve optimum health. You will find the benefits your dog will get are outstanding. There is simply no other supplement that can take your pet to a greater health and fitness level. Our new Gorilla Max dog supplement is really what your dog needs to reach their fullest potential in size, muscle, and health. For best results, use with Bully Max. Gorilla Max’s protein packed formula guarantees your dogs will get the nutrients they need to achieve real results. Your Dog’s Muscles are Largely Composed of Protein. Like other cells in your dog’s body, their muscles are composed of approximately two-thirds of water. After that, the next most plentiful component in their muscle cells is protein. Protein makes up about 20 percent of your dog’s muscle cell composition. Therefore, your dog will need to have a constant supply of protein in their body in order to continue to build and develop these cells. Without protein in their diet, they will have a very difficult time sustaining the cells that they do have and will certainly not be able create any type muscle growth. This is on reason your dog can benefit from Gorilla Max’s protein supplement for dogs. As your dog works out, the process of pulling sleds, weights, dock jumping, or performing other exercises causes the muscles in their body to begin to break down. The muscle cells themselves tear and become damaged. The result is that your dog’s body moves in to repair those cells. 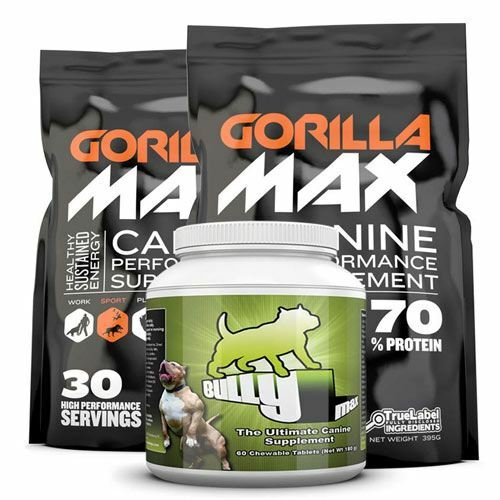 When you provide your dog’s body with Gorilla Max as it goes about repairing and rebuilding those muscles, it is then able to rebuild the cells even better and stronger than before. To break it down, your dog will not fully benefit from exercise without a quality dog protein powder supply in their system. In addition to building lean muscle mass, many people exercise their dogs to burn off fat and keep them in shape. Eliminating excess fat from your dog’s body can can keep them healthier and lengthen their lifespan. 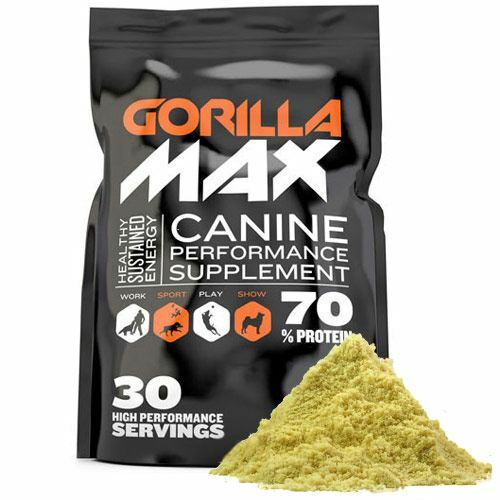 Using Gorilla Max protein supplements for dogs to help build muscle will effectively increase the speed at which their metabolism functions. This means that your dog will be more likely to eliminate the excess fat in their body by doing less work. They can, in fact, burn more calories and more fat while at rest, if you they have more muscle in their body. Essentially, Gorilla Max can function as a fat burner for overweight dogs. Can you use Gorilla Max and Bully Max at the same time? Yes, it is fine to use Gorilla Max while using Bully Max. What is the difference between Bully Max and Gorilla Max? While both products are designed for essentially the same purpose (Bullding Muscle, Adding Size, and Maintaining Health), Gorilla Max is the more potent form of the two. While you will receive the same results with both products, Gorilla Max will show results faster. How old does my dog need to be and is it safe? Gorilla Max is completely safe to use and has no negative side effects. It will only have a positive effect on your dog’s health. Gorilla Max is veterinarian designed, approved and recommended for all breeds of dogs ages 12 weeks and older. If you prefer to start your pups earlier, you can start off with Bully Max. Bully Max may be used starting at 7 weeks of age. Build Lean Muscle Mass • Raises your dog’s Health & Immunity • Increased strength • Muscle Recovery after workouts • Extended endurance • Works as an excellent Fat Burner for Dogs • K9 Athletes • Hard Keepers • Dog Protein Powder • Excellent nutrition for underweight dogs • Packed with 20 Grams of the best quality Protein Per Scoop • Added healthy Calories to achieve your dog’s maximum growth • Better Oxygen Delivery • Better health means less trips to the vet!